Weather Forecasting Instruments – Free Find-the-Words Game for Printer. You can download and print our FREE word puzzle game about weather forecasting tools for first to fifth grade kids. Our FREE science worksheets for kids are ideal for primary school kids, as a reading comprehension activity. Kindergarten and Pre-K kids can use our free online educator resources for science as a listening comprehension activity (without the need to print out the downloadable worksheet PDF). The Easy Science for Kids website provides educators with FREE and fun activities for kids online. It is completely free to download, free to print and free to use our online science worksheets resource. This free printable find-the-words science puzzle game is a great way for kids to learn fun facts about weather forecasting equipment and weather forecasting instruments. Your kids can also improve their reading comprehension with this free activity sheet, because it is fun to play and learn at the same time! There are different types of Instruments for weather forecasting. Some types of weather forecasting tools are used to measure air pressure. Other types of modern weather forecasting instruments measure the temperature. You can introduce your kids to these forecasting tools through this fun word search worksheet! [sociallocker]Download the fun weather forecasting instruments worksheet for kids. Download the Weather Forecasting Instruments Worksheet for Kids! Get to know more information on weather instruments here. Declan, Tobin. " 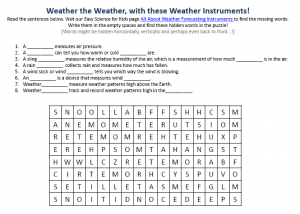 Weather Forecasting Instruments Worksheet - Free Find The Words Game For Printer - ." Easy Science for Kids, Apr 2019. Web. 21 Apr 2019. < https://easyscienceforkids.com/weather-forecasting-instruments-worksheet-free-find-the-words-game-for-printer/ >.